Last Monday, January 9, I had surgery on my knee—I tore a ligament playing soccer last year. It healed well enough for me to walk, but I would never have been able to play soccer again, or any sport, like badminton, where you jump side to side. Or leap from a stage, for that matter! It was day surgery and full anaesthetic, so I was pretty zonked the first day, but better every day since then. Starting to move and put some weight on it, but resting and not in the mood for much—like blogging! It’s the morning of Saturday, May 22, and everything is set up and ready to record my three-part-harmony rumba blues version of Hound Dog. Tannis and Jane are upstairs singing into their microphones as a test while Nik adjusts the volumes in their headphones. Adam and Jesse—always ready—launch into a jam. Sam: So, uh, are we ready to go, everyone, or . . .
Jane: Woah, check one, two, check one . . .
Tannis: Yep. Yep. Yeh, yeh, yeh, yeh. Tannis: I may be too loud. I may be too loud, I may be too loud . . .
Jane: Whoooa, they said you were high . . .
Tannis: I may be toooo loud. I may be loud. I like it like that. I like it, I like it. Jane: Not for me. No, no, no. N-no. No. Uhhh-nnn. Ah-h ah-h. Mmm. Sam: (Laughs) So shall we record one? It’s the morning of Friday, June 21, and we are preparing to record Sinner’s Child. It’s the first of the piano tunes, and more of a challenge to record because Doug Wilde is at the piano in the living room with me singing and playing guitar a few feet away, and Adam on drums nearby in the dining room. The piano is acoustic, and Nik sets up two mics between it and the staircase half-wall in hopes that the drums won’t overpower the piano. I’m sitting in the living room, playing my electric connected by a long cord to my amp around the corner in the bathroom. Jesse’s in the front hallway with his electric bass wired direct into the board in the control room. In the upstairs hallway, looking down at Doug on piano, Laura Bird, Tannis Slimmon, and Jane Lewis are warming up at their microphones. You can hear Adam whacking his snare drum with a brush, and the whirring of James Dean’s camera taking shots. Dennis Gaumond arrives early to sing on the next song and we invite him to hang out in the control room. Nik: (to Doug as to whether he should have headphones or not) . . . a little voice in the monitors . . .
Doug: I’m okay for now. Nik: Alright. You can hear pretty much acoustically except for the bass. Tannis (high)Jane (middle), Laura (low): hmmmm-mm-mm . . . whaaaaaat . . .
Sam: Nik, do you want us to just run some stuff, or . . . ? Tannis, Laura, and Jane: What about the . . .
Sam: Okay. Alright. It’s just you and me, Doug. Doug: Yeah . . .
Sam: So, whenever you wanna start. Here is the first transcript of the outtakes from AT HOME. Now you won't have to guess who is who! More to come . . . It is about 10:30 am, Sam is sitting in front of the microphones at his living room station, warming up his slide licks and vocals. He and Jane are talking about the logistics of the “Next Time” session that is about to start. Nik is in the office control room getting the gear ready to record. Tannis, Katherine, Jesse, and Adam are coming around the corner from snacking in the kitchen, carrying hot mugs of tea and coffee. Sam: . . . we’re going through. It’s up to them. Jane: Well, we’re probably gonna have to do a run-through to see the levels, so . . .
Sam: . . . positions on the set. Katherine: (stirring tea in the kitchen) Anyone else for tea? Or anything? Tannis: (settling at her upstairs microphone) There. Sam: So let me know when you folks are ready, and uh . . .
Jane: We’re, I think we’re ready up here. Everybody ready, ready up here? After an intense year, the latter half of December has been a bit of a respite. I thought I'd a take a breather for a few days, but discovered after that my body just didn't want to do anything—for a lot longer than I expected. It needed a holiday, a break, and there was no use pushing the river. It's been great sleeping in, going at my own pace, hanging out with friends and family, eating good food, reading a book, playing a bit. But after a fun New Year's Eve here with Jane, Katherine Wheatley, and Marianne Girard, making homemade pizza, playing board games, drinking champagne, and laughing our heads off, I feel like getting up and making things happen. Maybe it's the psychological sense of a new year. I don't know. In case case, I'm ready to go! In 1975, this suburban hippy boy got in a truck and moved to Bear River, Nova Scotia as part of a back-to-land commune called Dogsnest Farm. Jesse's mother, Ramona LeBlanc, was from Pictou County and introduced me to down-east culture, including the Boxing Day kitchen party. When we all eventually moved back to Ontario, our daughter Teri carried it on at her home near Peterborough. Ashley Condon, my PEI-raised, Canadian Folk Music Award-nominated niece was living with us six years ago when we decided to continue the tradition here in Guelph. That's how the Turton-Lewis Boxing Day Singalong & Jam started. We moved out the furniture, prepared the best homemade food, layed out the instruments, spread out the chairs, and invited all and sundry to eat, drink, sing, jam, and be merry through afternoon 'til midnight. It would start with an easy-going afternoon jam and turn into a mini-Woodstock by about 7:00 pm, when the dining room, living room, hallway and every step of the stairs was shoulder-to-shoulder belting out all our favourite songs. When the house was shaking from the massive harmonies it was like nothing I'd ever felt before. That was what inspired Ashley and I to start our Singalong events with our now-famous songbooks. Something this good could not be kept to ourselves! It was also this Boxing Day wing-ding that inspired me to record AT HOME. Last night it was a special thrill to sing some of those songs right here where we recorded them—with the whole houseful that inspired the music in the first place! Many thanks to everyone who came and made it the special day that it always is. For me, Christmas is neither religious or commercial. It is a time when things slow down. Daylight is at its lowest ebb, and things go into hibernation, gathering energy for the coming year. At this time when I slow down and reflect, the first thing that comes up is a question. Why do I sing? The first answer? Because it feels good. I really enjoy the sensation of singing, the sensation of the body vibrating that way. I like that this reason is independent of goals, success, or the approval of others. I can simply open my mouth and it's done. 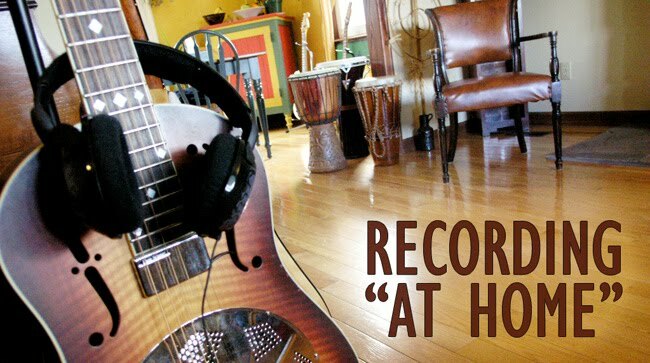 For my latest CD, "AT HOME," we returned to the traditions of community music and recorded live at our house. You can read my blog here about the process, and feel free to peruse the links above for my regular web stuff.